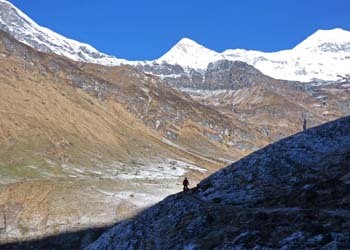 Five years after cycling the Char Dham in Garhwal in 2005 we returned to continue our route to the east. Bill Weir, whom wed bumped into on our previous trip, had covered some of the same roads, but few other cyclists have ridden there. What gave this tour a new complexion for us was the fact that we learnt of some mountain biking routes in the area. With our usual optimism wed looked at the Kukina Khal in trekking guides and wondered whether we could get our bikes across it. A few web searches led us to a company which claimed to support a mountain bike trip there, but which did not reply to our emails; and a few more led to Mountain Bike Kerala which had a trip to the Pindari glacier. Mountain Bike Kerala turned out to be run by an Englishman, Mike McLean, and to be happy to support custom tours. We made the arrangements and had the support of a guide Pankaj, a porter Chammu, and occasional mules, mulemen, and for a while Pankajs uncle Prakash. Mike was rather keen that we wear helmets, and you will see in the photographs that we acceded to his wishes. He also tried to persuade us to ride suspension bikes, but we had many reasons to decline: we dont own such bikes, have never ridden them, and needed to be able to carry panniers; and suspension is for softies is our occasional motto. Mike thought that wed spend more time pushing as a result, and enjoy the trip less. Maybe. In the end we didnt ride much on the Kukina Khal, but it was worthwhile as a natural route joining two valleys. We rode quite a lot in the Pindari valley. It wasnt the best year to be there: a late and torrential monsoon had caused no end of damage to the roads. The trip Mike led to the Pindari glacier  a month before our own  must have had it even worse than we did. The monsoon had barely cleared Garhwal by the time we arrived in mid-October. In these pages we provide the same sorts of information as for other destinations, but no gen page because it wouldnt differ much from what we wrote about Garhwal. We do, however, provide an especially attractive map. We also have downloadable copies of the USM series maps; click on the relevant area of the key map to the right.